Wanna meet at the bar after work? 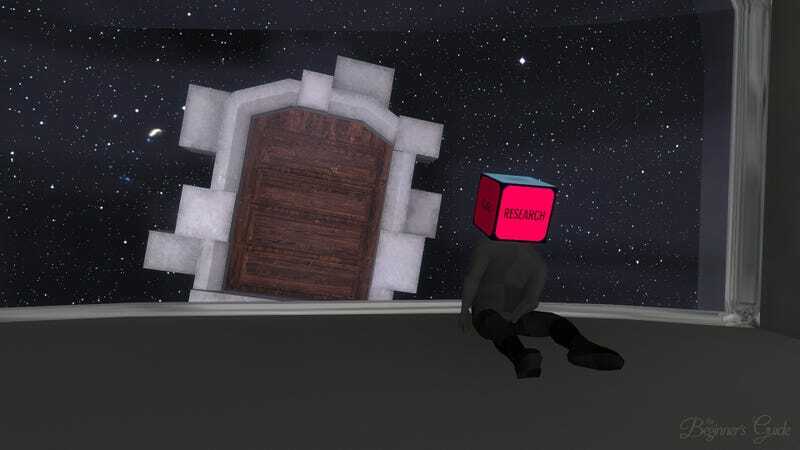 Because The Beginner’s Guide, the latest from The Stanley Parable co-creator Davey Wreden, is the kind of game you wanna talk about over several drinks. If The Stanley Parable was a game about games, The Beginner’s Guide is a game about game development. In The Stanley Parable, players waltzed through a world, guided by a quirky narrator. The story branched in a number of ways, based on player choices. Players were encouraged to defy traditional game logic—i.e. jump off a bridge and head towards a door that’s not on the main path—and were rewarded with new endings and scenes if they strayed from what they were “supposed” to do. For a few minutes, The Beginner’s Guide seems similar. Dropped into a Counter-Strike level, you soon hear an omnipresent, booming voice. Whereas The Stanley Parable’s narrator was a professional voice actor, this god-like figure is actually...Davey Wreden. The creator has become the narrator, but he’s not here to guide you through his own work. Instead, Wreden wants you to learn about a friend of his, Coda. Why? Coda stopped making games, and he’s hoping that spreading the word about their creations will spur them to return. Few video games have developer commentary tracks. Half-Life 2? Pillars of Eternity? Portal? Tomb Raider: Anniversary? It’s a small, rarely growing list. Video games love to rip off movies, but this has never really caught on. To Wreden, Coda’s creations are a rorschach test, and by examining their design, you can learn about the person—what they were thinking, feeling, etc. This isn’t merely an academic analysis, either. Wreden isn’t painting a picture trough Coda’s work alone; we quickly learn he’s known Coda for a time, too. The Beginner’s Guide takes place between 2008 and 2011, with Wreden jumping players between one game to the next, in the order Coda created them. One game is a shooter with a wonderful and unexpected glitch; another has you walking backwards; another involves walking up a set of stars very slowly; another is set in...well, you should just see for yourself. That’s largely the point. It’s not a spoiler to say it ends when we reach Coda’s final game, but it’s a spoiler to say much about happens before you reach that. It’s a difficult game to talk about, with the story—and its unexpected turns— being the reason to play. But let me ask: have you ever wondered what it’s like to make a game? Actually, scratch that. Ever wondered about the creative process—period? We glamorize the act of creation but gloss over what happens along the way. By we, I mean everyone. We put creativity on a holy-like pedestal, as though beautiful things—games, music, movies, whatever—are divine intervention, magically placed inside an individual’s brain, before it’s passed to the rest of us. In reality, it’s a messy, fucked up journey to making anything—good, bad, or otherwise. The Beginner’s Guide is sorta about that. Coda, whose work makes up The Beginner’s Guide, is described as private, quiet—a recluse. Since Wreden doesn’t have Coda to explain himself, he uses Coda’s work to paint a picture. But Wreden is painting the picture, not Coda. The player has no choice but to trust his interpretation. Put another way, in the age of Facebook, Twitter, and a other services demanding updates about this or that, it’s never been easier to peer into the lives of others. What do those updates even mean? How many are, in reality, half-truths? The lives presented in our updates—or, in this case, Coda’s video games—are not mirrors into the soul. But why does create anything in the first place? That’s complicated. When asked, we may double down on the value of art and expression, that merely the act of creating is inherently worthwhile. What if it’s not? What if, privately, we’re horribly scared nothing we’re doing actually matters, and releasing it into the world is a desperate plea for outside validation? “This is cool, right? Please tell me if it’s cool. Just tell me anything, really.” It’s easy to become addicted to this, this tacit acknowledgement of our existence. For some, that’s releasing a game. For others, maybe, it’s chasing likes on Instagram. The Beginner’s Guide is sorta about a lot of things, and, really, depends on what you bring to it. Interpretations may vary wildly, which is why Wreden tells you his email address at the start, asking for your interpretation of what’s to come. Based on how I felt at the end, I suspect people will have strong reactions to The Beginner’s Guide. More specifically, strong reactions to Wreden. I didn’t like him much—bit of a jerk, really. Wreden is a real person, not a fictional character. Is he playing one in The Beginner’s Guide? Is Coda based on a real person? It’s hard to say, we’ll probably never know, and it doesn’t really matter.